This was a Christmas present from Nuala and Joel (thanks guys!). I’ve not read Du Maurier before and although the book was fine, I won’t rush to read another. The plot was compelling and the characterisation was good, however I got frustrated by how obvious the plot development was and really annoyed with the lead male character, Philip, who was such a ninny! There were some good touches, and I particularly enjoyed the introduction by Sally Beauman for pointing out some of the finer points and historical gender politics. Met Nuala and Joel for lunch at the Royal China Club in Baker Street in London, which specialises in seafood dim sum and (expensive) tea. We had a great meal there was fast, good service. Excellent abalone roll and scollop dumplings. We heard about their wedding plans and a bit about the National Wedding Show that they went to yesterday in Olympia (nothing there for men!) Nuala and Joel went off to see the From Russia exhibition at the Royal Academy, whilst Michael and I went for a relaxing afternoon at the Porchester Spa, which is a fantastic sauna which is men-only on a Monday. I don’t think that ‘treatments’ is quite the right word, as they are all self administered, except for the schmeissing which I was offered by one of the regulars, but didn’t feel quite comfortable enought to accept (what would I have been accepting?). We spent three hours there, wandering into hotter and hotter rooms and then leaping into the cold plunge pool! It was very relaxing. Then onwards for dinner in Okawari Japanese Restaurant off Earls Court. We had massive bento boxes for dinner and luckily they came pretty quickly because we were short of time before going to see the highlight of the day: Cabaret at the Lyric Theatre, starring Julian Clary and May Nuttall as the MC and and Sally Bowles. I particularly liked Alastair Brookshaw’s solo at the end of Act 1, Tomorrow Belongs to me, which was very beautifully sung. Clary was excellent and this production was very chilling compared with the film version, which is the only version that I’ve seen before. We got back home just after midnight! Final breakfast and farewells before we were on the 8:52 train from Schladming to Vienna. The train is the »Ferdinand Raimund« named after an actor/writer who lived in the early 19th Century, and who committed suicide after being bitten by a dog that he thought might have rabies! Changed train at Leoben for Vienna onto an overheated carriage with a man eating raw onion and slices of gnarly sausage slathered with mustard. We joined him with a cheese sandwich made with, what turned out to be, quite smelly cheese. Michael also had Gernot’s golden egg. Bus to the airport and fast check-in set the standard for a fast journey. On the tube by 5pm. Home by 9. Had to walk home in the rain as the taxi queue was too long! Had a bit of a lazy start after the late night last night. We ate metallic blue and pink hard boiled eggs for breakfast (the golden egg was for Gernot). Gernot drove us down to the «Golden Jet» on Planai and we skied red runs 10 and 11 around the «Mitterhauslifts» and tried to stay as high up the mountain as possible to ski in the best snow, avoiding the slush around the middlestation. 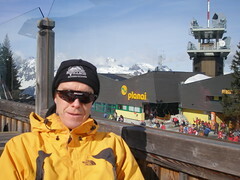 Gernot arrived at 1 and we had a good lunch at a nice hut just above the Planai gondola. I had blutwurstgröst, black pudding fried with potatoes and served with sauerkraut that had lovely coriander seeds in it. Skied a few more runs after lunch, the warming snow was building into lots of soft moguls and I had a lot of practice with moguls this afternoon. Michael stopped sking about 2.45 and Gernot and I did a few more mogul runs for an hour before picking Michael up and heading down the mountain. 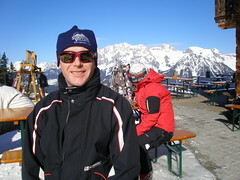 By the end of the day I was more succesfull at negotiating moguls and hopefully also more stylish. We stopped at a nice hut on route and I had a very nice jagartee. The ski out to the Golden Jet middle station got very slushy in places but it was fun and demanding sking too. Took the gondola down to the car park and so ended the skiing part of our holiday. 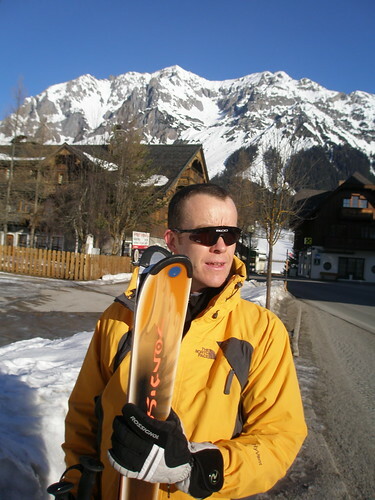 Dropped our hire skis back at the shop and then Gernot drove us back to Ramsau. where cream cake and then a good hot bath were waiting! Sigrid made us a traditional Austrian fondue, with a modern twist: instead of oil or broth the fondue was on a tower that looked a bit like a witches hat. 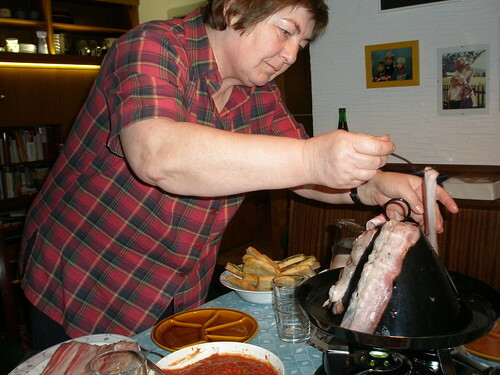 You fried the meat on spikes on the hat, which was heated from below by three burners, so it got pretty hot. We fried very nice young beef on this, and ate this with garlic bread and four delicious sauces: egg, spicy tomato, herb & yoghurt and a special cranberry and horseradish sauce made after last night’s meal. It was a very nice meal. Afterwards we sat watching German TV and the downhill slalom skiing from Whistler. 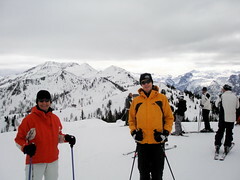 Alexandra drove Michael and I out to Zauchensee for a dy skiing at higher altitude. The village is at 1350m with the highest run at 2188m. The snow was in great shape at this hight and we had a great day skiing. We started off from Strimskogel and worked our way clockwise around the end of the valley. We skied the «Weltcupstrecke» which was fun and I did my first black run of the trip (to the bottom of lift 2). It took me a few mins to get up the bottle to go over the edge but then it all went well after then. 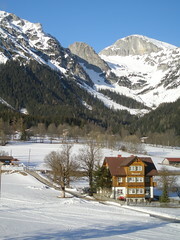 We made it right round the Zauchensee valley and into Flachauwinkl, the next valley. Here the ski routes crossed an autobahn and Alexandra was keen to see how this happened. When we got there there was a ski train, pulled by a tractor to take you under the road. I liked Michael’s suggestion of a gondola much better. Had Frittatensuppe and another germknödle for lunch along with a potent Jagertee (tea with rum and red wine). The smell was almost enough to make me feel tipsy. It didn’t improve my skiing though because I was pretty sluggish after the lunch break. We worked our way back round the valley and were surprised when it suddenly seemed to be 3.30. We skied out from the top of lift 7, a nice fast blue run. In the evening Gernot, Michael and I went to Gruberstuber for an ‘international’ fondue of turkey, beef and pork cooked in a nice broth. We had four sauces for this: curry yoghurt, yoghurt with herbs, redcurrants with horseradish and tomato with gherkin. We were pretty overwhelmed by the amount of food and the extra garlic bread and baked potatoes didn’t help! The international aspect came when the waitress poured sherry into the broth and them ladled it into small cups for us. This isn’t an Austrian tradition and had Gernot a bit flummoxed. Didn’t get out of bed till about 9.30, which was very welcome. Alexandra took us on the bus up to the Dachstein Glacier, where were going to ski the slopes at 2700m. The top of the glacier was shrouded in cloud with light snowfall and we decided after one run that it was too hard skiing in such low visibility. Instead we visited the new Eispalast at the top of the glacier.The Ice Palace is quite large and cut into the ice of the glacier itself. 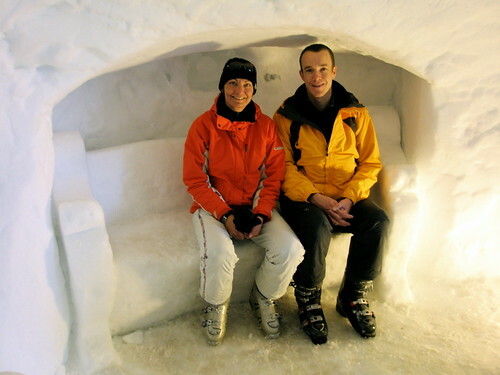 It is full of ice carvings that were brought in at some inconvenience by lorry. The sculpture were lit by blue spotlights that looked very good. 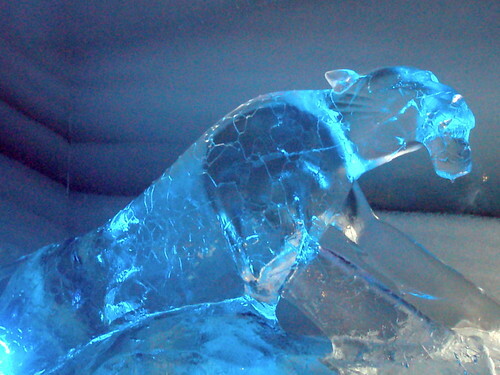 The strata of clear and opaque ice was very attractive. Apparently the Ice Palace had so many visitors over the summer that it started to melt: we saw some airconditiong in one part that might have been installed to cure the problem. 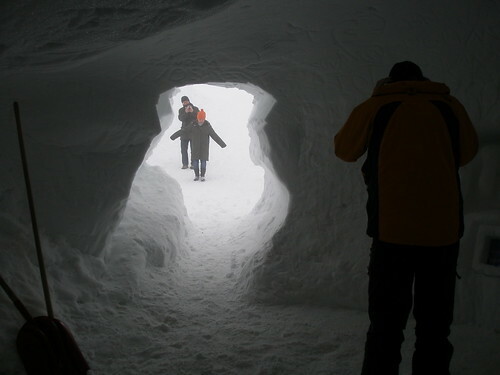 The temperture of the glacier ice never gets below -0.1oC, so hundreds of tourists would certainly have an effect. A professional photographer took our photo’s there. pictureproducts.at He picked on Michael and Alexandra’s colourful ski jacket (I had to stand out of the later shots because of my dull black jacket). Why do I look so small in this photo too? Took the gondola back down the mountain and headed over to Rittersberg (1600m) by ski. Had a good lunch, including butter germknödel, before doing some skiing on the mountain. 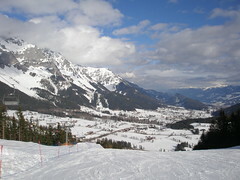 Rittisberg is the local ski area of Ramsau (where the night ski festival was on Monday). It faces in a sunnier direction and the snow was quite soft and heavy going by the afternoon. Did a black run a few times and a red one down to a t-bar. At 3m, we started to head home, skiing on trails down the valley and taking three of four lift along the way to gain some height. Travelled over 10km this wayto get from the Glacier back to Gernot’s house. 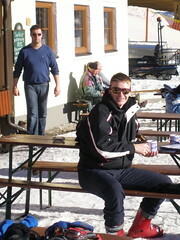 Stopped at Gruberstuber for beer at the end of the day’s ski, which was lovely. Had a good dark beer. In the evening Gernot took us down to the fantastic sauna in Schladming the Erlebnisbad. It’s the best sauna that I’ve been to. Light and stylish, with good staff. In the main sauna a person comes in every hour to add lots of steam and then whirl it around and flick the steam at you with a towel. The steam smelt fruity. It’s amazing and it was searingly hot! Afterwards a cold shower, icy plunge, then lay outdoors naked on a wooden rack looking at the stars through the steam rising from my body. Very relaxing. I also love the sauna with the smouldering wood chips and herbs, which smells great. The steamroom is also good and there were a couple of other options that we didn’t have time to try. Left at 9.30 in time to have a meal in the restaurant and join Gernot’s class for drinks, which was very nice. Slept for over nine hours last night and felt ready for a hard day’s skiing today. Got off the bus at the train station in Schladming and walked up to the new ‘Golden Jet’ Gondola base station. We actually took the much older (and shakier) Rohrmoos 1 chair lift up Rohrmoos mountain on our way up to Hochwurtzen. Three lifts later and after some long queues we arrived triumphantly at the top of Hochwurtzen at 1850m. We did a nice red run (Die Klassische) which was good, then went back up to the top on the Hochwurtzen Fun-Jet (mit bubbles) and did another red run (Die Vielseitige). Got a bit fed up with the queues at the lifts and so headed out towards Reiteralm at 1860m with lot more lifts. We had great time riding up a long, long T-bar (Holzerlift) and then practicing our carving on a great run (5, Holzerabfahrt). I managed a whole run of this, carving all the way. Although it wan’t that.stylish, it made me feel very good! We did this run about four times and it was quiet, with no queues for the lifts. Ideal. 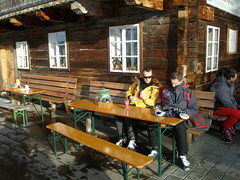 We had lunch at the bottom of this piste, Grillwurste and chips for me and spek brot for Michael. The Grillwurste was split at each end into four and the poor sausage looked quite tortured on the plate. After lunch we moved across to the other side of Reiteralm and skied the upper part of the mountain, avoiding the black runs (still!). All the runs were great. About 2.30 we started to retrace our route back to Schladming. We had to go up Hochwurtzen a little way at Pichl and, aside from a few icy patches, it was a great mix of fast tracks and red runs. 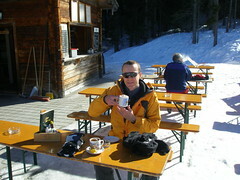 Got back to the Golden Jet at Schladming at about 3.30, and dived into a bar in the middle of the carpark to have a beer. 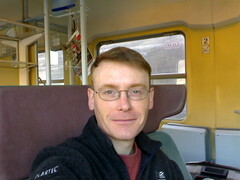 Michael bought our tickets back to Vienna on Sunday from the train station while we were waiting for the bus. In the evening Alexandra drove us into Ramsau village centre and we ate at Pehab: Michael had a fish special wrapped in bacon and I had a weine schnitzel vom Kalb. 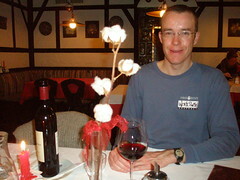 We also had some Austrian red wine, which was good to try. We enjoyed a stroll around the village an the walk back to Gernot’s house. Took a couple of buses to get to Hauser Kaibling mountain for 10. 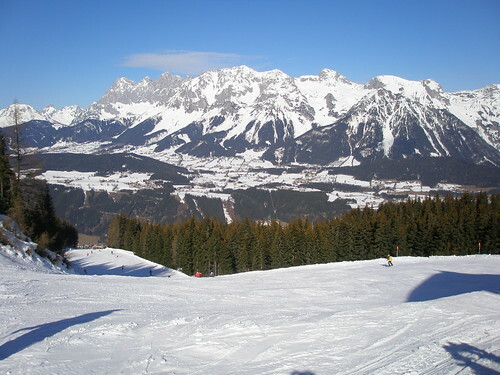 This as our favourite ski mountain last time we were in Schladming. Lovely noodle soup and then vanilla Germknödel for lunch for me, which may have contributed to a couple of impressive falls: 10m on my back after a tumble following a soft mogul and also crashed into someone when racing downhill. 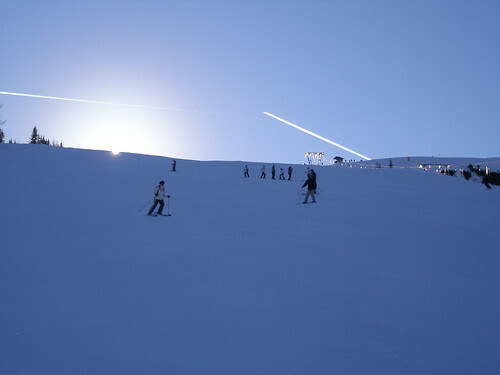 Great skiing though. We enjoyed tracks 2 and 4 which were open slopes in excellent condition. It was a very warm day: hat and scarves came off and Michael stripped off a layer too. Skied until 4. Moved to Planai about 2:30 to get ready to ski out. Dinner in the evening with Gernot and Alexandra in a pizza restaurant in Schladming. Started the day with a lovely breakfast from Sigrid. 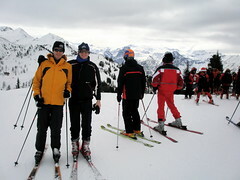 Gernot took us down to Schladming and we hired our skis and got our lift passes from the Olympiastadion on Planai. Worked out at €160 each for six days. There was a real scrum for the Planai Gondola which was at bit unpleasant, we’ll need to avoid a 9:30 start there for the rest of the week. Up the mountain we had a couple of runs on 8 (Weitmoosabfahrt) to warm up—I was very stiff. 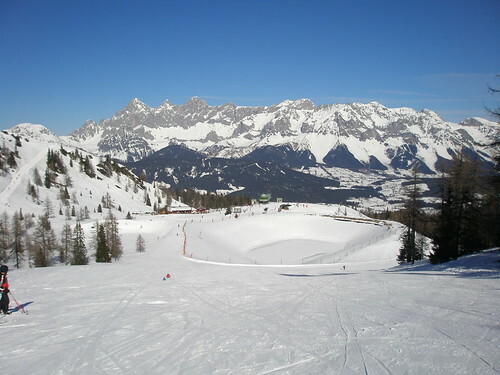 Then did a few runs on 12 (Die Schönfarerpiste), 5 (Die Sportliche) and 3a (Startstrecke WM-Abfahrt). Sometime during this we stopped for a hot drink. We had a bratwurst lunch, then headed over to the runs around 9, 3, 10 and 11, which are lovely, wide, open runs above the treeline, serviced by two very long, fast and steep T-bars. Great fun here until I took a tumble trying out some small moguls! Oh well, maybe at the end of the week. Our favourite run of the day was probably 5, which had some great curves. Finally we skied out from the top of Planai at 1894m to Schladming at 745m, via routes 8, 3a and 1. 1 (Die Shwungvolle is a great run, with a mix of steep and flat slopes. So we enjoyed the route out, arriving back into Schladming in time for the 15:10 bus to Ramsau. Skied down from the bus stop to Gernot’s house, which involved legging over a barbed wire fence to get onto the cross-country track. Michael went to Billa for a few snacks. 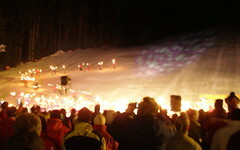 In the evening Alexandra took us to the Ramsau ski festival, where she skied down the piste carrying two burning torches as part of a massed display. It was beatiful. 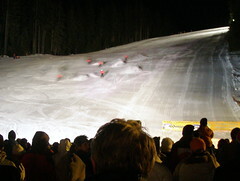 There was also synchronised skiing, skiing on stilts, uphill skiing on cross-country skis, tag skiing, speed skiing and the final display was of snow grooming machines from several mountains that drove downhill towards the crowds with their lights blazing and with fireworks. 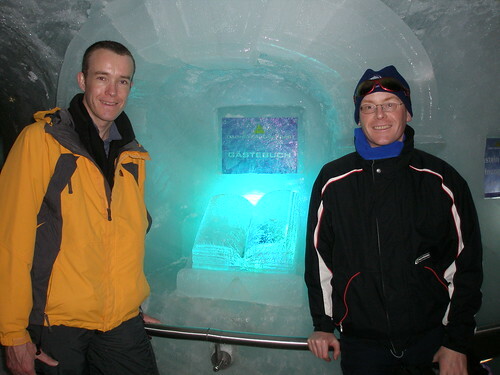 Had dinner in a bar before all the entertainment started and then a couple of glùwine from the icebar. Alexandra joined us for a tee mit rum, which turned out to be a rum mit tee (but they know her well there I think!). Michael and I had a wander about the city in the freezing morning. Walked down Kärtner Straße and Neuer Markt with nice Providentia-Brunnen fountain to Stephansplatz for St. Stephan cathedral. Met Gernot and Jacinto at the Koü Cafe at about 11.30. Had some lovely sencha and then Jacinto took us for a tour of the centre of Vienna. We went through Graben Straße which is a gorgeous street full of very desirable houses, up Kohlmarkt to the Royal Palace. 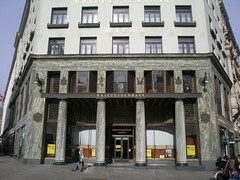 Jacinto showed us a lovely bank building that had scandalized Vienna when it was built, opposite the Royal Palace. I liked the grey plain marble front, but it is certainly a departure from the very ornate buildings surrounding it. 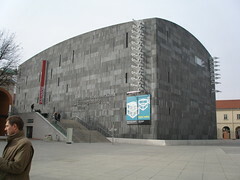 It was built by George Loos and is called the Loos Hause on the Vienna map. Walked through the Hofburg to Heldenplatz, where there was a muted celebration of Kosovan independence. A look at the Burggarten, where Gernot and Jacinto like to sunbathe when it’s not freezing, so not today. Walked up between the Modern Art Museum and the Natural History Museum to get to the Museums Quartier, which is a massive area of museums, based around very large royal stables. Had a nice lunch there, then had to head back to the hotel. Vienna is very gaudy and spacious, with lots of ornate buildings and sculpture. Said goodbye to Jacinto before Gernot drove us all the way to Ramsau, which took over 3 hours. We had a very nice welcome from Alexandra and Sigrid, and a diabalo pizza and beer, then an early night!